Recommendations for the introduction of common allergens to infants has changed over the last few years as research has emerged on ways to help prevent the development of food allergies in babies. In 2017, guidelines were released in the U.S. by the National Institute of Allergy and Infectious Diseases (NIAID) on prevention of peanut allergy. 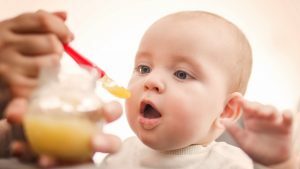 The guidelines are based on the groundbreaking LEAP Study, recommended introducing peanut to high-risk infants around 4-6 months of age to help prevent the development of peanut allergy. 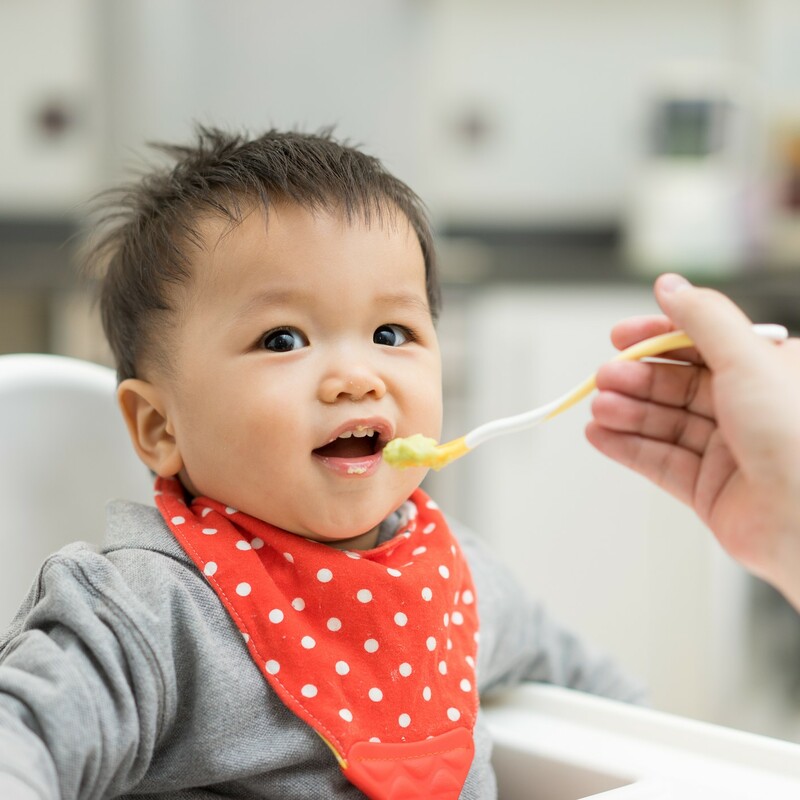 In 2019, the Canadian Pediatric Society released updated recommendations on the specific timing of early introduction of allergenic foods for high-risk infants. The new guidance is to actively offer non-choking forms of foods containing common allergens (e.g. peanuts, egg) around 6 months of age, but not before 4 months, as this can be effective in preventing food allergy in some high-risk infants. This represents a dramatic shift from previous advice to parents and caregivers regarding the introduction of common allergens in a child’s diet. Please scroll below for information on the introduction of peanut to babies. You will find two recorded webinars, one for parents and another for healthcare professionals, a frequently asked questions document for parents, and other resources for families and healthcare professionals. January 2017: The Addendum Guidelines for the Prevention of Peanut Allergy in the U.S. (a report from the National Institute of Allergy and Infectious Diseases (NIAID)) has been released, and it is a very positive step forward in preventing the development of peanut allergy. The guidelines represent a dramatic shift from previous advice to parents and caregivers regarding the introduction of peanut in a child’s diet. It is critical that health providers including allergists, pediatricians, and general practitioners share consistent information, based on the recommendations, so that parents can make an informed decision. The recommendations are based on the groundbreaking LEAP study which found that early introduction of peanuts to babies (4-11 months) identified as high risk for peanut allergy (based on an existing egg allergy and/or severe eczema), helped to prevent the development of peanut allergy. Guideline 1: As early as 4-6 months for those at high risk (severe eczema and/or egg allergy). Evaluation with testing is strongly recommended to determine if peanut should be introduced and the preferred method. Parents are advised to consult with their physician. Guideline 2: Around 6 months for those with mild to moderate eczema. Guideline 3: When age-appropriate, introduce freely in diet with other solid foods in accordance with family preferences and cultural practices. You can download the guidelines and summaries for parents/caregivers and clinicians on the NIAID website. We discussed these points in media interviews on January 5th/6th, as did Canadian allergist Dr. Edmond Chan, a member of the NIAID expert panel. Click here for more on the Global TV national news story. You can also read the Allergic Living article which provides a great overview of the guidelines. As always, we advise parents to speak with their physician if they have any concerns. We hosted a webinar in March 2017 with the Canadian Society of Allergy and Clinical Immunology (CSACI) on the new guidelines for the introduction of peanut to babies. You can view a recording of the webinar below, which includes a question and answer period. 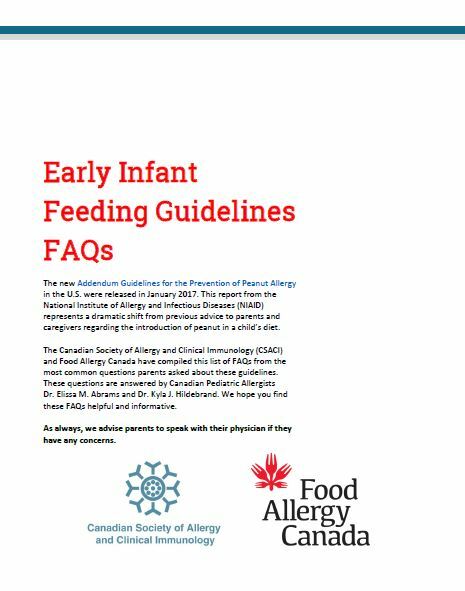 Below is an FAQ document which includes the most common questions by parents, answered by Canadian allergists. Please click on the document to view. We hosted a webinar tailored to healthcare professionals in June 2017 with the Canadian Society of Allergy and Clinical Immunology (CSACI) on the new guidelines for the introduction of peanut to babies. You can view a recording of the webinar below.